8:30AM DOWN FOR BREAKFAST what an amazing room large dining room silver spoon in the sugar bowl, peacocks and guinea fowl on the lawn. The breakfast served on the side help yourself incredible. 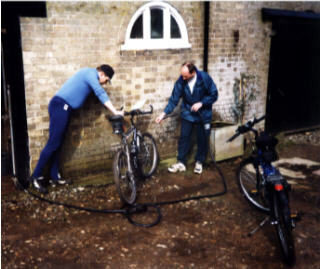 9:15am visitor book signed and a laugh with Elizabeth, bikes washed off we left Highfield farm after a taste of the high life we were to come back down to earth later. We cycle into Fakenham stop for cash and then a steady ride through pleasant countryside towards the Walsinghams. Colins bike crank starts to get noisy we need some oil. 10:30am ish into Little Walsingham passing the National RC shrine and Religious people walking from Walsingham to the shrine all with the rosary beads. Graeme also bulling me about my kit when I stopped to re-adjust my panniers, he said that if id been one of his men when he was a Corporal in the Marines he would of kicked my backside. We arrive in Walsingham lots of religious shops and tourists all along the way. We had noticed lanes blocked and farm machinery in field gates obviously to dissuade the religious fanatics. Lots of wisecracks in Walsingham Graeme falling of his bike and shouting" Jesus Christ." Colin saying we should be alright here we wont have to lock the bikes. 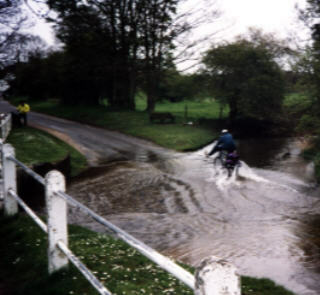 After a look round we cycle on through a ford. 4 retakes of Colin splashing through the water, getting wetter every time, while Graeme photographed saying faster this time a bigger splash would look good. 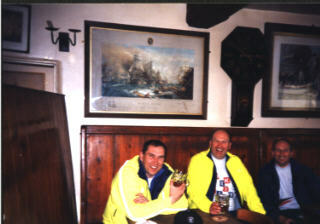 12noon We cycle the short detour to Wells - next - the -sea. What a lovely little place we stop and buy some multipurpose oil and I buy a windmill then down to the Lovely sea front. While Colin services the bikes, Graeme and me enjoy a couple of pints and fresh prawns off the front, watch the world go by and the boats going up and down the channel .We are there a couple of hours sun shining very relaxing it felt like we were on holiday. your money on the table and Lesley serves you. A real old fashioned pub full of Nelson nostalgia. The old chap in the pub chatted about local life told us we'd cycled the dry road from Wells so called because there were no pubs, the coast road is called the wet road because it has pubs. Chatted about cricket, the pub took a couple of photos signed the visitors book Graeme signed Cpl Brass 40th Commando due to Nelsons liking of the Royal Marines. 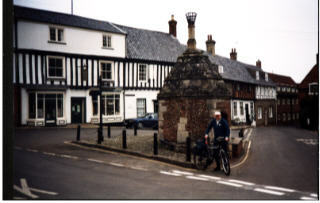 We then cycled to Burnham Market an small up market town. 3 30pm ish pushed towards Ringsfield a long climb into the wind and the rain we had to get punished seen as we'd been enjoying ourselves. Long steady climb over 4 mls, Colin earns the title King of the mountains he raced on up to the top of every hill and then circled, he also circled every pub and every junction I don't think he's worked out where we are going yet? The weather closes in as we approach Sandringham estate we have wind, rain and a fair share of hills to fight against I found this the hardest part of the ride. 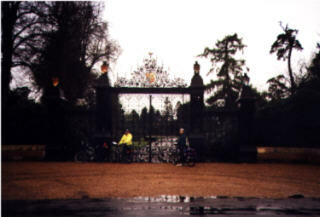 5pm ish Sandringham estate we pull up at the gates for a photo and then down to the famous church seen every Christmas the gate was open we rode right up to the church itself. get a ride round the housing estates of these towns. Peterborough. Colin then informed us he didn't like Pizza much anyway, we ended up having a decent Indian and pint on the way back to the dig's and cut our losses.